Beautiful addition for any of our bubble-up cat fountains. Made only for ThirstyCat Fountains. Will not fit other brands. 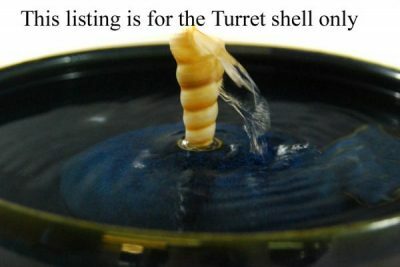 Natural Turret shell from the waters off the coast of Jamaica and region, specifically modified to fit any bubble-up cat fountain. They provide a nice, smooth stream with no splash and are an attractive addition to your cat fountain. In time they will wear, more quickly in hard water. Should last about a year. Colors will vary slightly. Includes beverage grade vinyl tube to attach to the pump. Easy switch in and out.